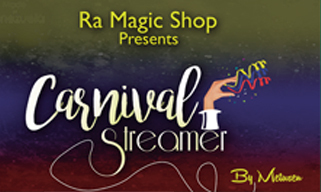 This Carnival Streamer is a throw streamer created by Ra El Mago and Metusen. It has 30 lines for each time you use it, providing a great and visual effect. Each one is 16 feet long, made of high quality materials. This adds great depth to your show. Vibrant Colors and very visual. Contains 10 Multicolor Carnival Streamers.